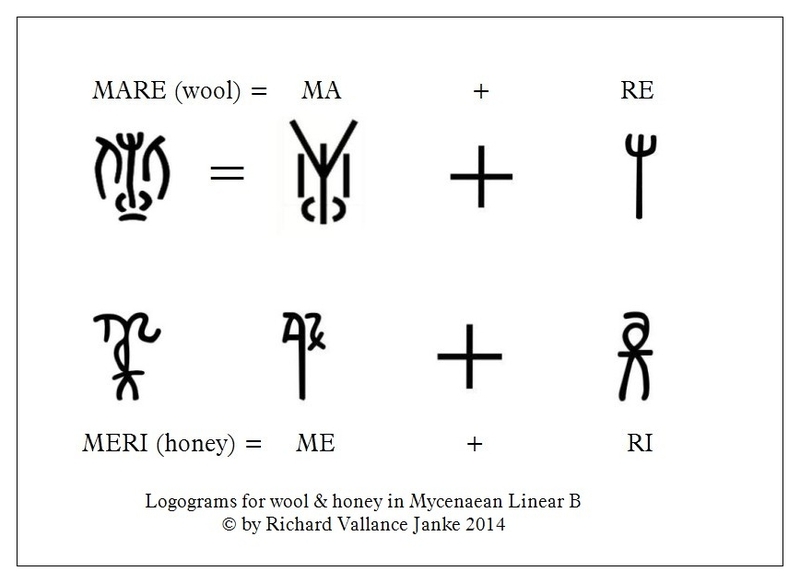 While the ideogram for the Mycenaean Greek word for “wool” in Linear B is quite straightforward, being as you can see the syllabogram RE superimposed on the syllabogram MA, there is one thing about it which stumped me for quite a long time. Why on earth would the Linear B scribes at Knossos and elsewhere substitute the syllabogram RE for RI to superimpose on MA, when obviously the word is spelled MARI in Linear B? On the surface, there does not seem to be any good reason for them to have done this, except that if we recall that the Linear B scribes were real sticklers for practicality, amongst other things, it really does not come as much of a suprise to me now that they substituted RE for RI, given that it is, to put it plainly, a simpler syllabogram to superimpose on MA than RI is. 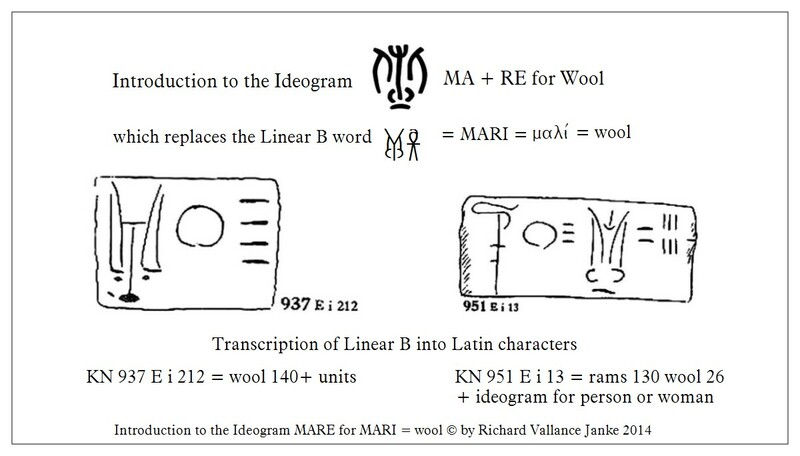 I have no idea whether or not that was their reasoning when they assigned this logogram, or ideogram, if you like, to symbolize the Linear B word for wool (MARI) other than the explanation I have just given here, which is consistent with the scriptural economy the Linear B scribes were so fond of. I of course welcome any and all conjectures as to why they would have done this. One thing is clear: it was not a decision based on boring old reason, but rather on practical application, a factor which was always uppermost in the minds of the Linear B scribes, a clever gang if I ever saw one. This second explanation makes even more sense than the first. The text of these two tablets, consisting as it does of logograms and ideograms alone, is quite clear, and warrants no comment. I can see your explanation for this Richard. Because while looking for something else in the Lexicon dictionary I noticed MeRe meaning Honey and did a little practice writing it. So I will have to watch this when I come to it, and not get MeRe and Mare mixed up. Yeah, that is sure true. I had a bit of trouble with these two words at the outset, but once you understand how the Linear B scribes SUPERIMPOSED one syllabogram on top of another to create a LOGOGRAM, it is not so bad. And as I said in the post, the scribes used RE on top of MA for wool, because RI would have been too hard to read. I am quite sure of myself on this point. But remember that the actual WORD for wool is MARI and for honey is MERI. Once you can wrap your head around this one, it becomes a lot easier to learn the other logograms, and there are quite a few of them.